Exquisite Vintage Colorful Fairy with Rainbow Wings Image! Today I’m sharing this Exquisite Vintage Colorful Fairy with Rainbow Wings Image! 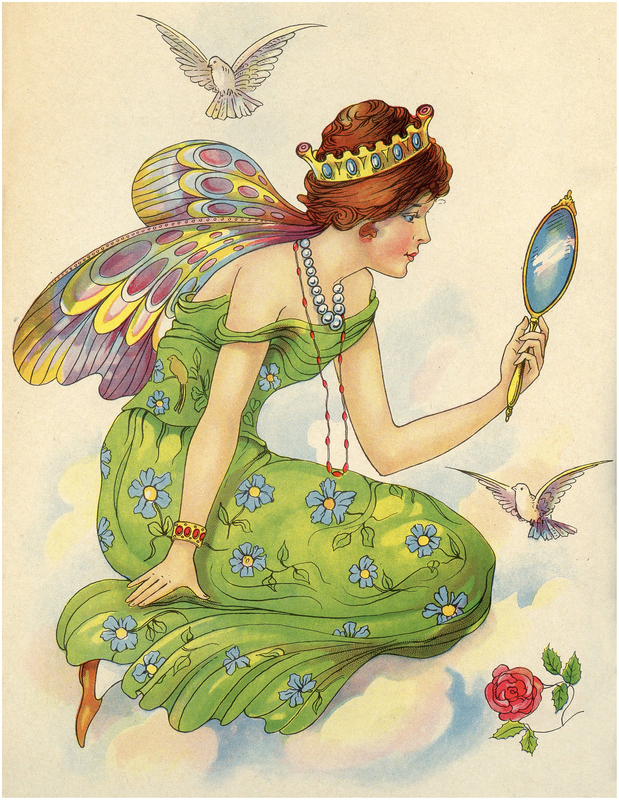 In this image, a beautiful fairy dressed in a green gown covered with blue flowers looks into a hand mirror. Her exquisite wings are a flurry of amazing rainbow colors. She wears a crown on her bright red hair and colorful jewelry. Two beautiful birds fly around her. It would make a lovely invitation to a dress up party. So nice to use in your Fairy Themed Craft or Collage Projects! This is another one that was scanned recently from an old children’s book that I recently acquired. 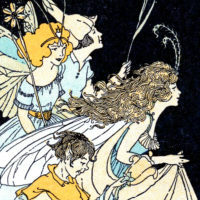 You might also like the Fairy Children Image HERE from that same book. 2 Fairy Party Images – Vintage Style! 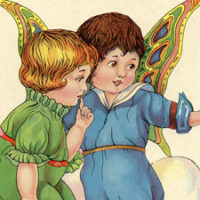 Super Sweet Vintage Fairy Images with Children! 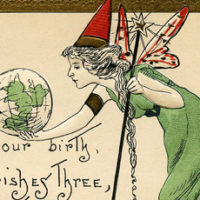 Adorable Vintage Fairy Godmother Birth Blessing Postcard! I am so happy you are enjoying them, thanks so much Angela! Hope our youngest enjoys these fairy images, will make frames for them, give to her. We use lathing strips, cut to size, painted or stained to make frames for many of your images. Thanks so much Karen for your generosity in sharing these. Thanks JaneEllen, I hope she loves them, you are so creative!! Wow, she is a beauty! I love her wings and colours. Truly beautiful!